Discover Basic Techniques That Will Help You Substantially Boost Your Sales & Increase Your Revenue? Will Help You Close More Sales & Make More Money? You will also learn some great tips and techniques that you can use to improve sales process, attract more prospects, improve your customer relations and make more money too! Inside every issue of the "Simple Steps To Better Sales" newsletter you'll learn valuable information on how you can successfully your sales and your income! 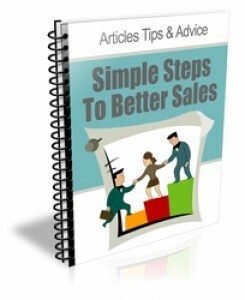 Simple and effective ways that can help you start increasing your sales as soon as possible. The importance of setting realistic goals, sticking to them and why it is an important of increasing your sales.